The win (25-22, 25-16, 25-6) snapped the Colonials two-game skid after they dropped back-to-back games to Baylor and Illinois State last weekend. GW (7-3) controlled the majority of the match, and never trailed through three sets. Head coach Amanda Ault said playing a mid-week match and regaining momentum would be crucial before GW heads to Valparaiso, Ind. for a tough three-game weekend, featuring two nine-win teams in Murray State and Valparaiso. The Hoyas, who entered the match with a 6-3 record and as winners of four of their last five outings, were unable to create any opportunities on offense. By the end of the match, no player for the Hoyas had more than five kills. 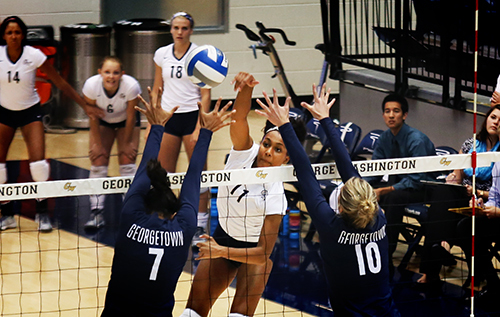 GW held Georgetown to a .000 hitting percentage as the Hoyas finished the match with 17 kills and 17 errors. Doyle, who led all players with a match high 15 digs, said for the veterans on the team, Tuesday’s match had a bit more intensity. 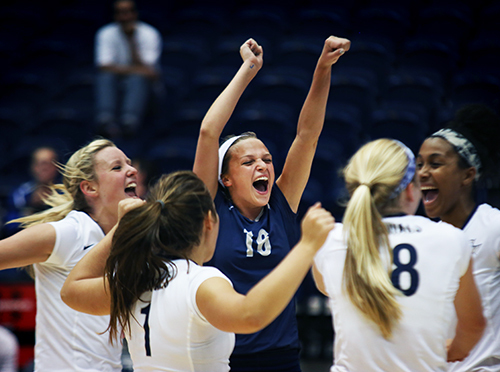 Last season, Georgetown defeated the Colonials in straight sets. On the offensive end, GW got off to a bit of a slow start, finishing the first set hitting .108. Ault said the offense seemed uncomfortable, which led the fourth-year head coach to make a change at the setter position: Sophomore Emily Clemens finished the match for the Colonials in place of junior starter Jordan Timmer. In the final two sets, GW dominated the pin, finishing the second set hitting .345 and the third set an errorless .667. Leading the way for the Colonials was senior Kelsey Kelsey Newman and freshman Aaliyah Davidson. Both players finished Tuesday’s match with 11 kills, a career best for Davidson. Davidson, who started in place of sophomore Loren Williams, hit .556 in the match, leading all players. “I felt I did well of taking care of passing and staying confident and calling the ball. I think I hit well today,” Davidson said. Most importantly for Ault, the Colonials displayed a level of consistency in their match that she said was missing last weekend. The players effectively used serving, which had been mediocre for GW the past three games. Ault said the team reached its 1:1 ratio as it tallied eight service aces against eight service errors. GW has three days to prepare for what arguably will be its toughest weekend of the season so far. The Colonials will play Sacramento State (4-7) on Friday, followed by a Saturday double-header against Murray State (9-0) and Valparaiso (10-1). Ault and Doyle said the key to winning this weekend will be taking care of the ball on the Colonials’ side of the court and maintaining their style of play throughout the match.